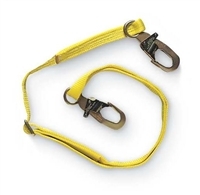 Professional Safety Supply's full line of fall protection lanyards includes safety harness lanyards, adjustable lanyards, fall arrest lanyards, restraint lanyards and positioning lanyards. Small snap hooks to large rebar hooks are also available, suitable for any anchor point. Falls are frequently the source of injuries and workers’ compensation claims. If you have employees who work at an elevation of six feet or more, they should be equipped with fall protection safety equipment to help prevent and mitigate the effects of falls. With the proper equipment and training, your employees can go a long way toward reducing injuries from falls. Protecting you from falls, look at the Miller Fall Clearance Calculator App.